It's built into your "lower" brain! Truth has this strange but welcome persistence. Surely, "truth" is relative in that each of us perceives reality through whatever "lenses" or "filters" we may have. But, reality isn't relative. It exists independent of our consciousness and the "ability of the experimenter to interfere with the object of the experiment", at least on the macroscopic level. So, actually the real truth exists independent of our "picture" of reality and if we are to be honest, truthful people, we must always endeavor to make sure our picture of reality, our "picture of truth" - matches reality and that we can communicate that reality - in common with others. "The unreal has no being; the real never ceases to be." So, the truth isn't really relative, is it? Our descriptions of it may vary, but that's due to our individual "gifts" or our individual impediments. Again, truth has this strange but welcome persistence. When the magicians have collected their mirrors and gone home and the smoke clears, that's what's left behind. Reality. We are then free to form our own "picture" of it, one that, hopefully will help us to live as free people. It is because of this that I trust each of you will come to the same conclusions that I have, that the American way is best and is diametrically OPPOSED to the very founding principles of the UN, which I have discovered through very thorough research and the diligent years of research by others who understand the nature of truth and therefore base their reputations upon it. Surely, the UN's "advertising" looks great, but their product is anything but the utopia promised. The UN doesn't acknowledge rights, but rather would grant "privileges" which it calls "rights", but then, in the same act of granting said privileges, takes them away. Being founded by communists, who will have no other God other than the state, they cannot possibly understand the concept of inalienable human rights that cannot be touched by the state. To do otherwise would be to invite rebellion when the people learn that they are not required to live as slaves. Remember that free men keep and must sometimes bear arms. Slaves do neither. So, when you engage in discussions about rights, remember that there are those who cannot distinguish between a right and a privilege. What follows is why that is so. Knowledge is structured in consciousness. There are structures in consciousness that form the basis of a framework on which we can build a worldview. The depth and breadth of consciousness determines how much of that structure we have available in our waking, day to day lives. An example of that is our grasp of Mathematics. How is it that we can discover a language - the language of math - that allows us to so completely model things in the objective universe? The answer may be that mathematical structures exist in some unmanifest form in consciousness and become alive and part of our working world view, our paradigm, when we proceed to awaken those structures through study and application of mathematics. In the same vein, knowledge is different in different states of consciousness. When you focus the attention to more outward, gross levels of awareness (i.e. out on the objective world) you are training your attention on objects of consciousness that are further away from that source of pure awareness. There is an old Taoist saying, "The further you go [from the Tao], the less you know". By the same token, the more you flow with the Tao, that state of unbounded consciousness, the closer you remain to that state of coherence where you might directly apprehend the laws of nature. So, by going from subtle, more powerful states of consciousness to grosser, more "distant" states of consciousness you can traverse different levels of consciousness and therefore different levels of knowledge. For example, by going within I might find some answer to a modern cosmological quandary. The question, "Is there enough matter in the universe to eventually lead to a complete gravitational collapse, a big crunch that will end the current universe at a new singularity (which then gives rise to the next "thought of Brahma", another universe)?" - might find an answer in some subtle level of awareness. A more subtle level of awareness might also give real insight (It's funny about that word, "insight", isn't it?) on object-oriented software development. We classify and categorize objects almost from birth and, if we get involved in OOA, OOD and OOP later on in life we may find that the structures, the classes we discover in the analysis phase of software development, arise directly from structures in consciousness that are actually based on natural laws. It may be that we have some interface at that subtle level of consciousness that does give us direct apprehension of natural law so that we may model our world through mathematics or build classes of objects in the memory of our computers. Unfortunately, it seems that some people are not quite "firing on all cylinders" (they are unable to "abstract" or form complete pictures of reality). That's one euphemism. I imagine you've heard quite a few. "So and so is a few cans short of a six-pack" or "So and so has the full six pack but just doesn't have the plastic 'thingy' to hold it all together" or "That person's a few hamsters shy of a full horsepower" may come to mind. Some people just aren't able to comprehend basic knowledge that you and I take for granted. We all have acquaintances like this that can follow a narrow or short train of logic, but it's usually one that just doesn't really fit well with reality. For instance, I have a neighbor who is into these "crop circles" and truly believes they are being made by extraterrestrials, even in the face of the evidence (on videotape) which shows some guys with a rope and a board, making crop circles. It seems such people are lacking full access to their mental potential, they've become "locked in" to a dysfunctional pattern of brain function when, even in the face of facts they just cannot deal head-on with reality. What this indicates is that these people are not using both the left and right hemispheres of their brains in a coordinated fashion where analytical abilities are paired with synthetical, artistic abilities to enable them to learn, to look at things in terms of their respective components and how those parts also function together as a whole. What's most unfortunate about it is that there is no need for people to go through life with their brain functioning impaired in this fashion, but the knowledge about how to correct that is often rejected out of hand for stupid (of course) reasons, usually political or religious. The tragic part is when such people, being dysfunctional, end up in mental institutions or correctional facilities. They cannot function in society, so they often end up dropping out of functional society and becoming part of the outcaste. They have to resort to crime to make a living, usually running some kind of scam or picking pockets. The ones using enough of their mental potential to still be moral will beg on a street corner, rather than steal. Even more tragically, these dysfunctional types often end up in power - where their mental illness impacts on the rest of society. It is more and more evident that the dysfunctional end up in government where they may plunder the masses under color of law. The rest, the ones who steal, are living on a flight/fight level that's doesn't require use of the higher cortex which is responsible for analysis and synthesis, the cycle of learning. It would be interesting to see from this perspective how people like this vote, what political-economic system they ascribe to. Since they're not self-sufficient, but still have the drive to survive, I'd imagine that they'd want big government to take care of them. That would allow them to believe they were absolved from the responsibility of caring for themselves. If government were there to take care of them, they might also start thinking that it was the JOB of government to do so! And such is actually the case! What these people are missing - due to their incomplete thought processes - is that government is paid for by TAXPAYERS, by FUNCTIONAL people who PRODUCE! What these dysfunctional people have managed to do is place the responsibility for their well-being on an organization that has to get money from functional people - by force! This explains how republicrats/socialists/communists are limited in their comprehension and do not possess enough "complete" intelligence (both analytical and synthetical, working together) to get beyond the surface details to the core of the issues. They don't seem to possess the level of consciousness, the breadth of awareness where the ability to make fine, abstract distinctions is enabled. What this means is that their "parity checking" isn't working and they cannot distinguish between fact, fiction and misdirection and is also why they possess such moral ambiguity where there is no "right and wrong, black and white". Have you ever met a communist that really understands economics, who realizes that a centrally planned and controlled economy cannot work and eventually collapses under the sheer weight of corruption? Well, you won't meet one who does understand this or many other concepts you and I take for granted. The reason for this is simple. It is because these individuals are used to operating from their limbic systems which is also known as the older reptilian brain. In spiritual terms, this is known as thinking and acting from the lower self. Communists are spiritually bankrupt and need to work on increasing their awareness. Only by doing this will people be able to see all the facets of the "master hologram" or the "big picture" and how all the parts fit together. Collectivism - a state of mind. Anyway, all this is a long, roundabout way of saying that because of the level of consciousness Republicrats share with Karl Marx, due to this mental dysfunction, they have the same beliefs and they're indistinguishable from communists. It's the same level of consciousness. Because communism is a "mental aberration" that causes masses of people to engage in criminal behavior (redistribution of wealth, genocide, violation of the 1st, 2nd,… well, the entire Bill of Rights…), the Republicratic party is therefore the party of criminals, the party of communists. This is something we cannot abide, even though the behavior is an outgrowth of abnormal brain functioning. This level of brain function is what allows these folks to steal from others. Due to the lack of access to the full mental potential, they become amoral, they become collectivists who have lost sight of the fact that stealing, even by electing someone to steal from others for them via "legitimate government functions" - is wrong. So, it all follows that the need in this country isn't for more morality, per se, but is instead a need for more consciousness, the ROOT of morality. You cannot be moral from a state of slumber and morality is the very foundation of our form of government. The only option we have is to WAKE PEOPLE UP! We must get them to use more of their mental potential by optimizing their brain functioning. However, as we're all aware, this isn't always possible and unfortunately, some of these brain-dead individuals are in places of power where they cause great harm. And while they're in those positions, they will continue to steal from us on the pretense that they're going to give it to "each, according to his need…", stealing it "from each, according to ability". That may leave only one recourse where these individuals are concerned. I think everyone has observed that the statists (whatever flavor) in this country are essentially dysfunctional types who are incapable of understanding personal liberty since they are personally unbalanced as described above. If you can't make it in the world, if you can't accept that fact that it takes hard work and continuous education, or you're incapable of putting forth the effort, I guess you'd tend to vote yourself largess from the public treasury rather than accept the fate of the incapable, the life of the incompetent. Then, that's when the reptilian cunning kicks in and people use their limited intelligence and foreshortened reasoning to form a DEMOCRACY - or convince themselves and others that they live in one - and by being in the majority of non-working, non-productive, incapable sorts of people (for whatever reason - crack, heroin, genes…) they can engage in criminal behavior like voting representatives into office who will pass legislation making it legal for them to steal from all the rest of us. Somehow - in their minds - because it's not direct theft from my pocket to their hands, it's not really stealing. At least, that's how their reasoning works. That reasoning is the product of limited consciousness, the result of which is the eventual destruction of our nation. What happens when these dysfunctional people take over a government is they always attempt to limit the rights of others. This is the way they ensure their collectivist survival. Individual rights threaten their collectivism, so they always attempt to transmute others' rights into privileges. Think about that for a moment. Not taking individual responsibility for their own lives, they try to deny that individuals SHOULD be responsible for themselves and they attempt to eliminate any thought or speech that threatens that belief. Specifically, on the subject of gun control and our inalienable right to keep and bear arms, people who are incapable of defending themselves and keeping crime at bay as citizens - because of their dependence on government - seek to disarm others as they simultaneously continue to empower police. What they fail to realize, because of their discontinuous, limited reasoning is that as they empower police and the state of which they are a part, they are abdicating their rights and the rights of others as well. Socialist leaders couldn't be more pleased than to have these "useful idiots" abdicate their rights to the state because "useful idiots" actually grow the state where socialist leaders will rule - acting from the reptilian part of the brain that builds "empires". The incomplete reasoning of these "useful idiots" also fails to take into account what you and I consider quite obvious about police and military personnel. People who abdicate their right to self-defense for themselves and others do so -- to other people. That's right! Police and military personnel are people, too. These non-self sufficient, unreasoning socialists are abdicating their right to self defense - to other people who differ from themselves only in that they are capable of handling firearms responsibly. Of course, if we think for a minute, military and police may be the types of people who WANT that kind of power as opposed to being the patriotic kind of persons who accept responsibility and think in a balanced fashion with complete thoughts that take the Bill of Rights into account, which prohibits them - as government agents - from treading on individual rights. Again, this is a case where short-reasoning or short-sighted individuals betray their lack of vision. While abdicating the right to keep and bear arms, they may be inviting people who are ATTRACTED to power, to rule over them. This is very short-sighted, indeed. What I'm getting at is that police and military - at least the American Patriot kind whom the "useful idiots" assume they're dealing with -- are just normal individuals with training. The gun-grabbing socialist dependents of government have completely forgotten to take their reasoning to the last step which is to realize that ordinary people can learn how to use firearms appropriately and safely. That being the case, why do they treat police and military as a distinct "warrior caste" or warrior class that has some supposed "supernormal ability" when it comes to work that includes the use of firearms? Or is it that these warriors are using firearms in the course of their work as agents of government that makes them different from ordinary citizens? Either way, people who have limited consciousness and therefore an incomplete thought process tend to fail the test of describing reality when they make their argument that the second amendment doesn't apply to individuals - as if police and military were another species of human being. Then, these non-thinking people (I mean, what else can you call an incomplete train of thought? I call it non-thinking) make the leap to the conclusion that "cops with guns = good / ordinary people with guns = criminals and crime and masses of accidental shootings that statistically far outweigh the numbers of individuals who drown in buckets". All the examples of corruption we see from day to day also reveal a weakness in the reasoning of these useful idiots that doesn't take into account the rampant abuse of power by agents of government and the purposeful, dishonest use of so-called statistics (a.k.a. propaganda). The upshot is that people who are so limited in consciousness as to be classified as criminals - have risen to power so that they can re-legislate our laws in their favor, thus removing your right to a fair trial, your right to own property, etc. They have placed themselves so they can perpetuate their criminal existence - at our expense, since they are dependent, because they are not self-sufficient due to their undeveloped mental potential. The society where a "ruling warrior class" was at the top - in a total police state - has been tried several times. Feudal Japan is a good example of that. The peasants died by the thousands, sometimes merely for the reason that a couple of warlords were having a head-chopping contest. That happened in NanKing, with Japanese occupation forces, showing once again an incomplete thought process on the part of our socialist "friends" who fail to learn from history. They always fail to learn that it is people like themselves who are slaughtered in a police state - because of their own folly. What this reveals is the schizophrenic nature of the socialist (incomplete) thought pattern. On one hand they advocate increased police powers over citizens, abdicating the right to keep and bear arms - for all of us, but they rail against all the abuse of power their narrow little focuses of attention can "buffer" from current events, without regard for the lessons of history! Again, this is a result of being incapable of formulating a "big picture" that is coherent with all the details - which we can observe from history. It reveals a disconnect with natural law and the ability to think clearly when people fail to take history into account, to make history a part of their own personal "big picture". This is why the failed system of collectivism continues to rear it's ugly, genocidal, democidal head. People keep forgetting the fact that as they empower the police state, the police state turns on them and wipes them out. You have to be a real "loose screw" to forget something like that. I'll repeat that collectivism is a mental disorder. We must also consider WHO it is that wants to disarm the populace. On the surface, it is quite obvious that criminals would like to see a disarmed populace. It makes their "job" a whole lot safer, now doesn't it? Who else? How about a megalomaniac who'd like to get rid of a whole population that he considers a "public health menace", supposedly like gun owners? That hasn't happened on this planet before, now has it? That brings us to the next reality, the reality of evil and conscious doers of evil. Again, it goes back to the ability of the individual to use enough of their mental potential to form complete thoughts. There is no question that people who are dependent on government and who are willing to trade their liberties for a little (illusory) security - will get neither, but that they fail to recognize this because they've failed to think it through - is quite clear. The question then remains, "How many of us will these useful idiots take with them as a result of their stupidity, their inability to learn?" Scientifically speaking, what kind of relationship? With their incomplete thought processes, which stem from the inability to access their full mental potential, these people are completing a fully parasitic relationship with their fellow humans. Of course we know what happens to the host in a parasitic relationship where the parasite doesn't know when to stop the relationship and move on to the next phase of their life cycle. In the case of the socialism we see growing here in America (and we have seen this time and time again on this world…) this complete parasitism is killing the whole organism we know as our country! Folks, we're in the hands of mentally ill, criminal parasites! They are making decisions about the type of government we'll eventually have and whether we citizens will be able to defend ourselves from the likes of them! They've constructed a system that declares anything that threatens their Marxist utopia - hate speech -- and this non-thinking passes for reason with others who have the same inability to think! I think it's time to wake up and realize that we're in the hands of madmen and crooks. The question we have to ask ourselves at this point is, "Is there a cure for this disease?" and if not, what do we do? The Roots of Collectivist Consciousness in undeveloped, immature thinking that results from limited awareness, limited consciousness are hard to "pull" in the way you'd pull a weed. That would, in fact, be illegal and would abrogate the rights of "potential individuals" in the same way they seek to limit OUR rights, thus bringing us to their level of criminal consciousness. Such would not constitute balanced thinking - unless of course, it became a matter of our very survival. So, what do we do? Well, I can suggest we use the same strategy and the same tactics that THEY use, because THEY understand them - in their limited reasoning. We must socially engineer our way BACK to balanced thinking by promoting the American way. If we can. This means education or doing that which exercises reasoning. That would be the "exoteric" approach. The more esoteric approach would be to teach them a technique which directly balances the brain by creating inter and intra-hemispheric brain-wave coherence, along with other positive, holistic physiological changes. An approach using both would be the best, and part of the "exoteric" approach could actually be …well, shooting! In summation, the roots of collectivist thought are the very roots of the growth of world government. It is the lack of consciousness that causes people to lose sight of moral principles, principles which reside in the higher cortex, which God has given us in order that we may "manage the garden", so to speak. This same lack of consciousness is what the New World Tyranny (hey, a new acronym! NWT) is counting on. They will be able to install their whole infrastructure by getting non self-sufficient government dependent, amoral individuals to abdicate the freedoms they're too unconscious to appreciate. The NWT will be able to do this right under the noses of these well-intentioned useful idiots because of their inability to distinguish the difference between the UN Tyrant's advertising and their actual product - because the root of collectivism lies in individual mental dysfunction. "Good intentions will always be pleaded for any assumption of power. 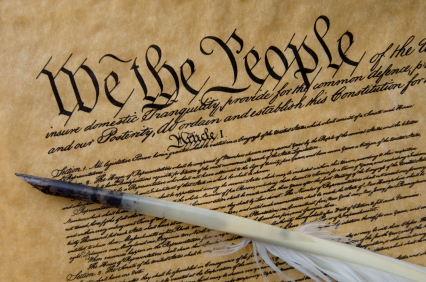 The constitution was made to safeguard the people against the dangers of good intentions. There are men in all ages who mean to govern well, but they mean to govern. They promise to be good masters, but they mean to be masters." -- Daniel Webster. 1. Any power that can be abused will be abused. 2. Abuse always expands to fill the limits of resistance to it. 3. If people don't resist the abuses to others, they will have no one to resist the abuses to themselves, and tyranny will prevail. Also: see Constitutional Conflict to see how our founding principles are being subverted by our own government.